Purpose: The Patient Protection and Affordable Care Act changed the paradigm of health care delivery by addressing interprofessional education (IPE) and care (IPC). These considerations, combined with evolving dental hygiene (DH) workforce models, challenge DH educators and clinicians alike to embrace IPE and IPC. The objectives of this study were to determine DH program directors' perceptions of the importance of IPE, to assess current and planned activities related to Commission on Dental Accreditation (CODA) standards that imply competency in IPE, and assessment of outcomes. Methods: Email addresses of the 322 entry-level, DH program directors in the United States were obtained from the American Dental Hygienists' Association and a web-based survey was developed based on the American Dental Education Association Team Study Group on Interprofessional Education. Descriptive statistics were computed for the responses to the closed ended questions and answers to open-ended questions were transcribed and thematically coded. Results: A response rate of 30% (N = 102) was obtained from the DH program directors. While the respondents indicated that they personally considered IPE to be important, one-third reported that IPE was not a priority for their academic institution. The majority of current IPE activities related to the 2014 CODA Standards 2-17, 2-26 and 2-19 were clinic-based (Standards 2-17 and 2-19: N=49; Standard 2-19: N=64). Fewer classroom-based activities were reported (N=12 vs. N=25). The respondents planned 27 clinic-based, 9 classroom-based and 51 other future IPE-related activities. Competency assessment was mostly determined with clinic-based activities (N=43) and other activities such as rubrics (N=16) and the development of IPE assessment tools (N=10). Thirty-three respondents named positive aspects of IPE and 13 saw IPE as relevant for the dental hygiene profession. Conclusion: Accountable accreditation standards have been identified as the driver of change for incorporating IPE, making an explicit IPE standard for dental hygiene education an important agenda item for the profession. The Patient Protection and Affordable Care Act changed the paradigm of health care delivery in the U.S. by embracing interprofessional education (IPE) and interprofessional care (IPC), following the recommendations of the World Health Organization, the Institute of Medicine, and the Interprofessional Education Collaboration.1,2 IPE has been defined as students from at least two disciplines having courses together either discretely or across the entire curriculum3. IPC in health care is the optimal provision of patient care because of the contributions of different areas of specialization and the use of evidence-based decision making4,5. This paradigm shift is significant for the dental hygiene profession because it stresses the importance of interprofessional team efforts in disease prevention and patient care. This presents an even larger challenge for the dental hygiene profession because IPE is only implicitly mentioned in the CODA Accreditation Standards for Dental Hygiene Education Programs. The inclusion of IPE in the accreditation standards of health disciplines has been noted as an imperative mechanism for its successful integration.1 Because curricula are often driven by accreditation standards, they they motivate change.1 Therefore, the lack of accountable IPE standards may present a significant barrier to the incorporation of IPE into dental hygiene education. Results from a recent survey of dental hygiene program directors in the U.S. found that very few programs are engaging in IPE endeavors that can be defined as true IPE activities.16 Therefore, central questions to be addressed should include the dental hygiene program's level of engagement in IPE, how the IPE engagement takes place, any challenges encountered with IPE, and whether the graduates are successfully prepared for IPC. Given the implicit nature of the Accreditation Standards for Dental Hygiene Education Programs related to IPE, the objectives of this study were to determine (a) dental hygiene program directors' attitudes concerning the relevance of IPE, (b) current IPE activities as well as IPE activities planned for future implementation in the curriculum, and (c) the methods used to perform IPE-related outcomes assessments. This study was determined to be exempt from Institutional Review Board (IRB) oversight by the IRB for the Behavioral and Health Sciences at the University of Michigan in Ann Arbor, MI (HUM#00083956). Recruitment emails were sent to the directors of the 322 entry-level dental hygiene programs in the United States. The program director emails were obtained from the American Dental Hygienists' Association website. The recruitment email contained a web link to an anonymous electronic survey adapted from a survey previously used by the American Dental Education Association (ADEA) Team Study Group on Interprofessional Education to investigate IPE activities in U.S. and Canadian dental schools.3 An electronic, revised version of the survey used by the American Dental Education Association (ADEA) Team Study Group on Interprofessional Education, which had previously been used to investigate IPE activities in U.S. and Canadian dental schools10 was sent to all program directors individually using University of Michigan lessons. Permission to adapt this survey was obtained from Dr. Allan J. Formicola, head of the ADEA Study Group. Statistical Analysis: SPSS (Version 21.0. IBM Corp. Released 2012. IBM SPSS Statistics for Windows, Armonk, NY: IBM Corp.) was used to analyze the data. Descriptive statistics such as percentages and means were computed to provide an overview of the responses to the closed ended questions (see Table I and Figure 2). Answers to open-ended questions were transcribed and thematically coded by the authors. Major categories and subcategories were identified, inconsistencies between the coders discussed and resolved, and the frequencies of responses in each subcategory were determined. A response rate of 30% (N=102) was obtained. Table I provides an overview of the program characteristics of the 102 responding dental hygiene programs. The majority of responses were from directors of programs at community or 2-year colleges that granted an associate degree. Figure 2 provides an overview of the reported importance of IPE to the program directors themselves, their academic institution, and the dental hygiene profession in the U.S. While the majority reported IPE as important both personally (58%), and for the dental hygiene profession at large (57%), only 40% thought it was important for their academic institution. Table II provides an overview of the open-ended responses concerning current and planned IPE activities related to the DH accreditation standards that imply interprofessional interactions. Current IPE activities were centrally connected to clinic-based activities (Current Standards 2-13 & 2-15: N=49/Current Standard 2-22: N=64) and to a lesser degree to classroom-based activities (N=12 vs. N=25, respectively). Specific clinical activities were: outside medical consults, consults with staff or volunteer dentists in the clinic (N=19), and the treatment of patients at enrichment sites or volunteer projects. Faculty assessment of student clinical performance, and collecting patient data for each student were also mentioned as clinic-based IPE activities. Classroom-based activities such as research pre-sentations and communication courses were relatively less frequently mentioned. When asked in which way their programs were preparing future IPE activities related to these standards, 37 programs reported planning mostly clinic-based IPE activities. Thirteen program directors simply stated they were compliant with the standards. Dental hygiene program directors' perceptions of the importance of IPE for themselves, their academic institution and the dental hygiene profession in the U.S. In regards to IPE outcomes assessment related to these CODA standards, faculty evaluation of students' clinical performance (N=25) was most frequently reported. The most commonly used outcomes assessment of classroom-based IPE activities were rubrics (N=16), and reflections (N=9). Over 20% of respondents reported they did not assess IPE-related efforts related to these standards, and 5% were unsure if they were assessed. Program directors were asked about the challenges related to IPE they currently encounter, and those they expect to encounter in the future. Table IV provides an overview of the responses regarding these perceived barriers. Some of the top barriers reported were (a) curriculum overload (76%), (b) faculty calibration (48%), and (c) outcomes assessments (32%). Open-ended responses raised concerns such as inexperienced faculty, the newness of IPE, gaps in the literature, and lack of cooperation from other disciplines. A major contributor to this underrepresentation is the fact that IPE is not explicitly mentioned in the current CODA Accreditation Standards for Dental Hygiene Education Programs (see Figure 1). Standards 2-13, 2-15, and 2-23 all have implications for IPC, in that they require the comprehensive collection of patient information. 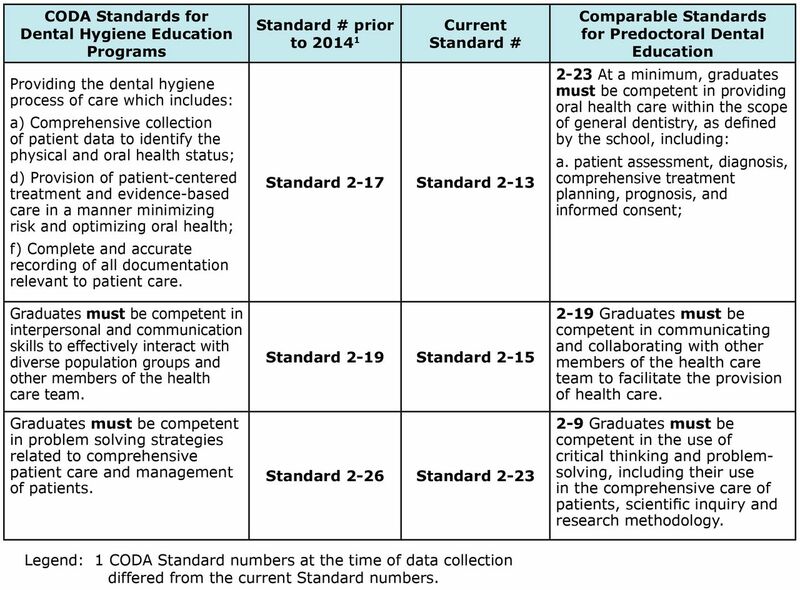 Standard 2-15 requires graduates to be competent in interpersonal and communication skills for interactions with other members of the health care team.4 A comparison of the standards for dental hygiene education with predoctoral dental education shows a clear parallelism. However, the predoctoral dental education standards explicitly require IPE. Dental Standard 1-9 states, “The dental school must [sic] show evidence of interaction with other components of the higher education, health care education and/or health care delivery systems.”18 This is a direct statement that requires accountability in accreditation reporting. The parallel standards dental and dental hygiene education share have been noted in the literature as having implications for IPE1, making it seemingly important for dental hygiene educators to embrace IPE. In regards to assessing outcomes related to Standards 2-13, 2-22 and 2-15, respondents felt that they were compliant with these standards in general, but their responses were not necessarily tied to assessing IPE-related outcomes in this context. While 17% reported they have not assessed IPE efforts from the perspective of these standards, others reported chart audits, classroom participation grades, and National Board Dental Hygiene Examination scores as outcomes assessments for IPE. This reiterates the importance of the need for an explicit IPE standard. Table IV notes the specific barriers reported by program directors, which are consistent with those found in the literature. Time is invariably one of the largest challenges noted across disciplines. This has notably included lack of understanding by other health care disciplines, which has continued to be a barrier to establishing engagement in interdisciplinary education.14 Lack of proactive measures on the part of administrators needed to address resistance to change by both faculty and staff, and the significant allocation of institutional resources to manage the details of these changes have been identified as major obstacles to implementing IPE in the literature.13 Understanding of these barriers must be complemented with an understanding of best practices. Support from institutional administration is a key component in the successful integration of IPE.13 Failure to have equal support across administrative units weakens any IPE initiative from the start. Integration and curriculum overhaul require the use of valuable faculty and institutional resources that are frequently already overtaxed. Finally, forming IPE partnerships has been found to help build opportunities to become part of such teams. These partnerships have been identified as a must for a paradigm shift in dental and dental hygiene education. Whether engagement is achieved through inclusion in already developed IPE programs, establishing IPE initiatives at their institution, or forming partnerships with community stake-holders, the lack of opportunities must be overcome.12 Lack of engagement with other disciplines has frequently resulted in misconceptions regarding the education and scope of practice of other health professions.21 These misconceptions have created hierarchies that are difficult barriers to surmount in creating IPE efforts as well as clinical practice. This study had several limitations. First, due to the self-reporting nature of survey instruments, bias can be introduced, limiting the validity of the findings. Second, the response rate is also somewhat low, representing around one-third of dental hygiene education programs. Additionally, respondents may have consisted of those who are most interested and engaged in IPE, making it difficult to generalize the findings. In summary, the new paradigm of IPE is recognized as valuable to the future of dental hygiene by program directors. IPE is especially important for the dental hygiene profession given its changing scope of practice, within the evolving health care delivery system. Dental hygiene educators and their programs are well placed to collaborate with other health and social/behavioral disciplines, to include oral health in the primary care setting. Unfortunately, dental hygiene is notably absent from those health and social/behavioral professions with accountable accreditation standards for IPE. This is a significant barrier to engaging in the new health care paradigm that includes IPE. While this and other barriers are a reality, the body of evidence to support IPE, and best practices for its implementation continues to grow. Dental hygiene educators and the profession in general must understand the true definition of IPE and IPC, barriers, and best practices of IPE in order to engage in IPC. While best practices are key to the successful implementation of IPE, accreditation standards have been solidly noted as the driver of change in the incorporation of IPE into already existing health education curricula. Therefore, the explicit requirement of IPE in CODA dental hygiene standards must become an agenda item in order for dental hygiene to stay consistent with other health and social/behavioral professions. The majority of dental hygiene program directors in the U.S. consider IPE as important for themselves and the dental hygiene community at large. However, only about 40% responded that their own academic institution considers IPE as important. Given that dental hygiene CODA Standards do not explicitly include IPE, it is not surprising that not all programs engage in genuine IPE efforts or plan to include IPE activities in the future. In addition, IPE related outcomes assessments are also not performed in all programs. We want to thank Dean Emeritus Dr Allan Formicola and the American Dental Education Association Team Study Group on Interprofessional Education for allowing us to utilize the ADEA IPE survey and adapt it for use with dental hygiene program directors. Danielle Furgeson, RDH, MS, DHSc is the director of the graduate dental hygiene program and clinical assistant professor, Department of Periodontics and Oral Medicine, Division of Dental Hygiene; Marita Rohr Inglehart, Dr. phil. habil. is a professor, Department of Periodontics and Oral Medicine, School of Dentistry and adjunct professor, Department of Psychology, College of Literature, Science & Arts; both at the University of Michigan, Ann Arbor, MI. This manuscript supports the NDHRA priority area, Professional development: Education (evaluation).
. Interprofessional accreditation standards in the USA: a comparative analysis. J Interprof Care. 2013 Mar;27(2):123-30.
. Interprofessional education in U.S. and Canadian dental schools: An ADEA team study report. J Dent Educ. 2012 Sep; 76(9):1250-68.
. Interdisciplinary approach to care: The role of the dental hygienist on a pediatric feeding team. J Allied Health. 2012 Winter; 41(4):190-7.
. Integration of an oral health curriculum into a physician assistant program. J Allied Health. 2011 Spring; 40(1): 19-24.
. A case study on the development of an integrated, multidisciplinary dental curriculum. J Dent Educ. 2013 Jun; 77(6):679-87.
. The future of the dental hygiene profession. Int J Dent Hyg. 2012 Jan14;10(1):1-2.
. Connecting dental education to other health professions. J Dent Educ. 2012 Jan;76(1): 46-50.
. The development of a questionnaire to assess the readiness of health care providers for interprofessional learning (RIPLS).Med Educ. 1999 Feb;33(2):95-100.
. Assessing professional perceptions: Design and validation of an interdisciplinary education perception scale. J Allied Health. 1990 Spring;19(2):181-91.
. Is dentistry at risk? A case for interprofessional education. J Dent Educ. 2008 Nov;72(11):1231-7.
. Faculty perceptions of interprofessional education. Nurse Educ Today. 2011 Aug; 31(6):571-6.
. Physician assistant students' views regarding interprofessional education: A focus group study. J Physician Assist Educ. 2013;24(1):35-41.
. Interprofessional education: Effects on professional practice and healthcare outcomes (update). Cochrane Database of Systematic Reviews 2013, Issue 3. Art. No. : CD002213. DOI: 10.1002/14651858.CD002213.pub3.
. Interprofessional education in U.S. dental hygiene programs: A national survey. J Dent Educ. 2015 Nov;79(11):1286-94.
. Interprofessional education and practice guide No. 5: Interprofessional teaching for prequalification students in clinical settings. J Interprof Care. 2016 May; 30(3):324-30.
. Interprofessional education for students of the health professions: The “seamless care” model. J Interprof Care. 2009 May;23(3):224-33.
. Stereotyping as a barrier to collaboration: Does interprofessional education make a difference? Nurse Educ Today. 2011 Feb; 31(2):208-13.